There are not many Hong Kong Spanish Restaurants. But there is one under a big chain that you must try. Paella served in Hong Kong Spanish Restaurant. I L..O..V..E anything served in the ink sauce. YUMMI!!! I always go to the one in Causeway Bay near Hong Kong World Trade Centre. It started out with one of my best friends, Anna. We always go to different restaurants for our annual gathering. 1) Spinach and Cheese in Filo Pastry Rolls - It is not over cheesy. The rolls are warm and crunchy. The size of this appetizer is perfect for 4 people. It allows you some room to try other great dishes. 2) Crusty Bread served with Garlic and Tomato sauce - This is another great appetizer. Unlike the tomato sauce served at home or other restaurants, the sauce is not mushy and watery. You can actually spoon the fresh tomatoes on the bread. This restaurant's entree is definitely my favorite. If you are not a food adventurer, you may want to pick other entrees from the menu. 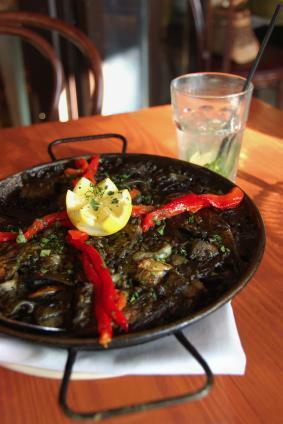 3) Seafood Paella in Ink Sauce - If it is the pasta version, the pasta is made with ink sauce already infused which would be black. If it is the rice version, it will be tossed in the sauce after cooking to coat it. I love, love, love the sauce which tastes so great. There is no fish smell. When you are done, your lips are black. When I visited in 2009, we made a special request that we wanted the sauce on top of regular pasta instead of inked pasta. They did it. It was AWESOME. If you fall in love with inked pasta, you can check out Pacific Place . Perry bought me a pound of fresh pasta in 2007 from there. Last time when I went back, I realized that they don't sell fresh pasta anymore. They do sell packaged inked pasta. You can also buy it online. For drinks, they have Sangria. It has fresh peaches, oranges, apples and some other fruit. You can choose either alcoholic or non-alcoholic. El Cid Spanish restaurant also has a branch in Festival Walk. I have never dined there. But I would assume they provide the same quality of food and service. 3. Mijas Spanish Restaurant - Murray House, Stanley .